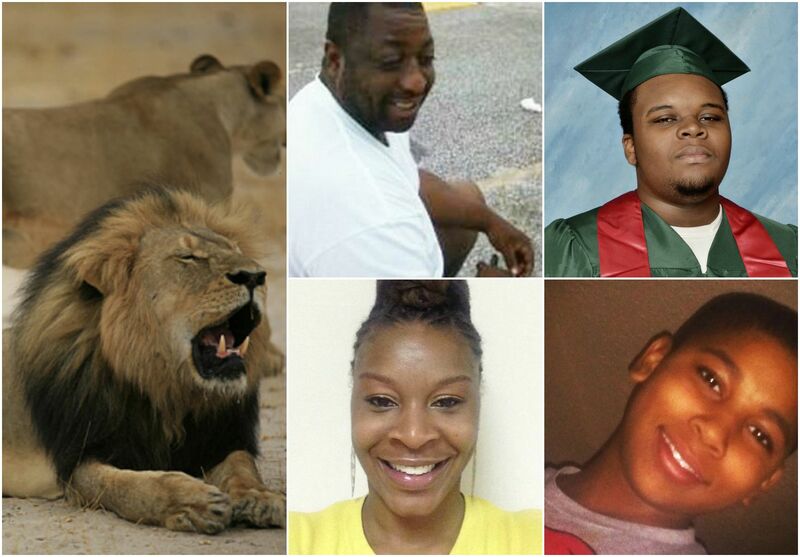 Why Does Cecil The Lion Receive More Humanity Than Slain Black Lives? Does that make you feel better knowing a White person said it and not just another “angry” Black person? I’m going to let you know right now that I don’t care either way. For once, you’re right. I am angry. Black lives are slain everyday at the hands of police, self-proclaimed neighborhood watchmen and people who claimed they feared their lives. Whether in routine traffic stops, on a playground, or worse, at a place that sells guns while a Black man attempts to buy one, Black lives are taken. These officers of the law are paid to protect and serve. These days, they’re paid assassins. “Do not say that nothing’s changed when it comes to race in America — unless you’ve lived through being a black man in the 1950s, or ’60s, or ’70s. It is incontrovertible that race relations have improved significantly during my lifetime and yours, and that opportunities have opened up, and that attitudes have changed. That is a fact. When I found myself in the middle of a verbal fist fight on Facebook, I knew this wasn’t what I wanted to be doing with my time. Or my energy. I don’t have enough of either one of those these days to spare. I could have ignored it, but the keyboard called my name like I was Meek Mill in the middle of the night. One of my White friends shared the story of Jimmy Kimmel getting choked up over Cecil and proclaimed that Jimmy was the “man!” That’s fine. That’s what Facebook is for–it’s our opinions, thoughts, interests, all shared publicly. So I responded publicly. “People are dying. PEOPLE.” The friend who initially wrote the status said nothing, but one of his friends–a White woman–responded to me. I wish I could give you the words verbatim, but I have since blocked her, so I can no longer see her responses, but it was something to the effect of: You need to use your own page for your negative comments. This is (my friend’s) page and he’s using it as a place to express sympathy for Cecil. I snapped. I crackled. And I popped. The back and forth led to her proclaiming that all lives matter, even animal lives. Saying Black lives matter doesn’t negate all other lives. All lives matter. But, we need the hashtag, the movement. It’s an effort to celebrate ourselves and fight against the untimely deaths that keep taking us out and White people want to take it as exclusionary. White people–your slip, or rather, your privilege is showing. White people don’t get to decide what WE fight for every single day when we are switching lanes, playing in the park or trying to buy a gun in a store that sells guns. Evidently, White people do get to decide that money can buy them whatever they want–including a sick and illegal thrill, like killing a lion, cutting its head off and skinning it. Sounds awful, doesn’t it? Well, it’s awful to watch a Black man die because he’s unsure why he’s being pulled over. And we’ve watched that, time and time again. It’s very sad when any animal or any person is murdered. I am disappointed in the people who would rather be sad over a lion than to even acknowledge not only the Black lives in America that have been slain, but the African men, women and children who have been hunted like animals for longer than it took that White dentist to gather the money to bribe wildlife authorities, matter too. We’ve been dying for a historically long time. We’ve been dying at the hands of our authorities, aggressors, those who claim they fear for the lives and oppressors for centuries. From the African Holocaust to the Atlantic Slave Trade to Emmett Till, Rodney King, Trayvon Martin to Sandra Bland. We’ve been hunted all our lives, all of our ancestors lives and stories like Sandra’s prove that we still are being hunted. We are no longer safe in our homes, stores, churches–nothing is sacred. Black people keep getting reinforcements that our lives don’t matter. We are yesterday’s garbage, today’s sensational headline, but we’re not precious until we’re dead. And even that is arguable. Because often times we die, only to have the media feed people insignificant and negative details about our lives to cradle a delinquent narrative. This gives the people who refuse to acknowledge our lives having worth, the evidence they need to justify our deaths. Mike brown robbed a store, so yeah. Sandra bland was belligerent to the officer, so yeah. Tamir Rice shouldn’t have been playing with a gun that looked so real, so yeah. Meanwhile Dylan Roof, James Holmes and so many others like them get to be spared and dignified through mental illness. Violent White lives get to be wayward kids. And we are aggressive thugs. Sandra Bland doesn’t get to tell her story. But for the media who gets to relay the message, they’ll choose to say her arrogant attitude, the threat of her lit cigarette and the incessant need to respond to the antagonizing officer was what catalyzed her death. What about the other women who’ve died in police custody this month? The men, the children, the people? This is the land of the free and the home of the brave, but the actions of our authorities are spewing a very different tagline: The land of the captive and the home of the coward. The cowards who refuse to use their voices to lift of the names of the fallen. To acknowledge that Black lives are being disproportionately slain. Cecil’s life mattered. That’s why we’re all sad, but where’s that same respect for fallen Black lives? And the countless others who were allegedly murdered by police. The question should be: Why are BlackLivesMatter activists trying to pit one tragedy against another? Attempting to shame people toward your cause has never been an effective way at gaining support. Most people can care about more than one issue at a time and the creating a battle between which is worse, Cecil the lion’s death or the deaths of unarmed Blacks, is a battle destined to just piss people off and lose the goodwill the BlackLivesMatter movement has achieved thus far. My advice: Don’t go down that path…you’ll get lost and won’t find a way out. I agree with you completely. The eloquence of your post should really open a few eyes. Pointing out folks’-and particularly white folks’-moral/Cognitive dissonance between their outrage over a damned lion and their not much to say-ness over systemic oppression resulting in the unjustified killing of countless people of color is not pitting two causes against each other. It is *correctly* calling said people out for their hypocrisy/ self serving blind spots and challenging folks to think critically about the two causes and about which should have priority. I’m white. I get it. The author is absolutely right, and your comment seems to suggest your one of the white folks who needs to read this article and other nuggets of well-written commentary on the actual state of race relations in this country as opposed to the sugar coated schewed commentaries we whites far too often create to protect our own white identities- and do so more than once. Wow!!! I am almost speechless after reading this! While I have heard brief information regarding Cecil the Lion I can only imagine how some people have managed to make a larger deal of this situation in lieu of using critical thinking skills as it pertains to black lives. It saddens me that “some white people” routinely value the lives of an animal over black people. However will quickly become defensive when a black person elects to shine light on the blaring lapse in judgement and the truth about how black people are treated in America. Then of course next the fact that they have a black friend should proved to you that they are somehow now how you perceive them to be. I believe you said it best and look forward to check back in to hear your take on various topics!